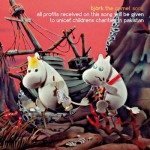 new from Bjork, and for the stop-motion children’s film titled Moomins And The Comet Chase, comes “The Comet Song”. debuted at the Cannes Film Festival in May 2010, the movie hits theaters this August. in a generous offering to the recent flood victims, all funds generated will go to UNICEF Pakistan childrens charities. see a video for the song below, we gotta check this flick out!